Last time I posted (two weeks ago), I wrote about how I was going to get better at blogging and that Spring Break would give me so much time to write. I’m a liar sometimes. Sorry. BUT I do actually have a post written and ready to go up Wednesday, and I have a REALLY EXCITING (so exciting it deserves capslock) giveaway coming up next week, so please don’t leave me. Wednesday’s post is a catching-up-on-life kind of post, so tonight, I’ll catch you up on training the last two weeks. I got a little overzealous in clearing pictures off my phone, so I have nothing from last week. Oops. Yasso 800s for a total of 10.5 miles. I did them on the treadmill, which is kind of cheating on Yassos because it sets the pace for you, but I had meetings in the evening, so I had to do a morning workout. I felt good, so that’s a good sign. AM: 45 minutes strength. The only thing that got me to the gym was knowing that this was the last early-morning wake-up for over a week. 18-mile fast-finish long run. You probably know that fast-finish runs are my nemesis, but I nailed this one. I felt really, really good about it. Rest. I did 30 minutes of yoga. I rolled out of bed before 7:00 because that’s sleeping in when you’re an old lady, and I hit the gym to lift. It was delightfully empty. Later, I ran 12.5 miles easy, in the middle of the day because it was spring break and I could. J and I went to the Capitol to gripe to our legislators about students being overtested and underfunded, and then we headed up to Fort Collins for the State Science Fair (J had a kid competing. I had a desire to mooch his hotel room and play in Fort Collins). When we got there, I headed out for 10.2 miles with 7 at tempo — the best tempo run I’ve had this whole training cycle. It was encouraging, to say the least. 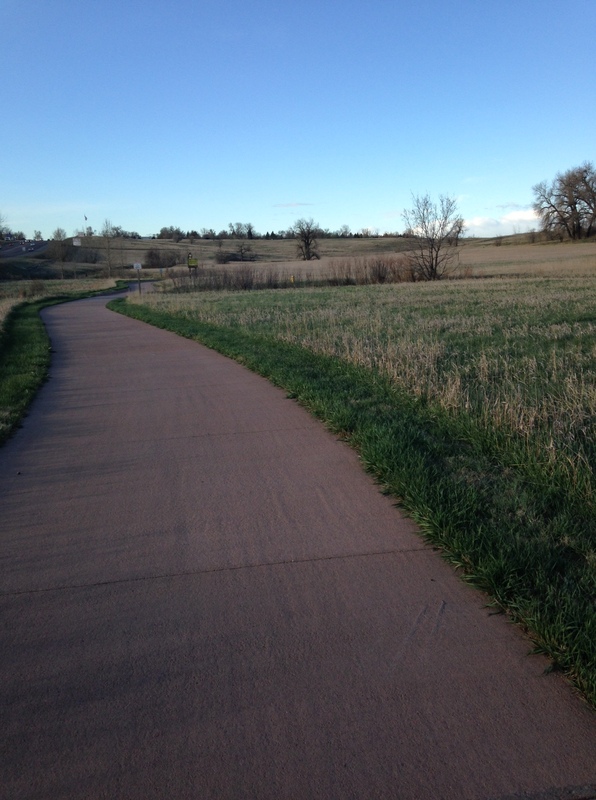 I love Fort Collins and its ubiquitous bike paths. They make running so nice. 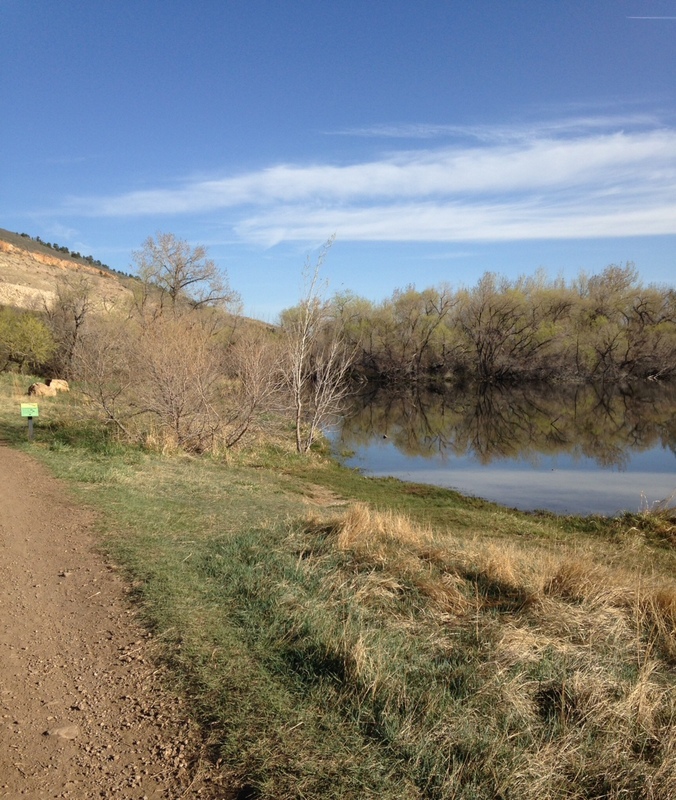 Funny story: I’d e-mailed Heidi and Logan, who both live in Fort Collins, to see if we could get together for a run. Heidi and I planned to meet at 5:30 on Thursday, so I got up all early, got ready… and waited in the lobby for quite a while. Turns out, Heidi meant 5:30 P.M. For whatever reason, I just assumed she meant A.M. So I got up early for no reason. Communicating is hard. I lifted in the highly mediocre hotel gym until it got light, then headed out for 9.1 miles, again enjoying the heck out of Fort Collins. On Thursday, I bought trail shoes, so I was dying to try them out on Friday. Logan and Heidi had suggested a certain natural area, so I went out there. I’d run/hiked those trails a bunch of times in college, and had no idea they were part of that natural area. I am smart. I’m also not in good trail shape. It was hard, and I was secretly glad that neither of the other gals could meet me, because I would’ve been quite embarrassed by my lack of trail fitness. Funny how I can run 70 miles a week and still feel out of shape. But look, pretty. 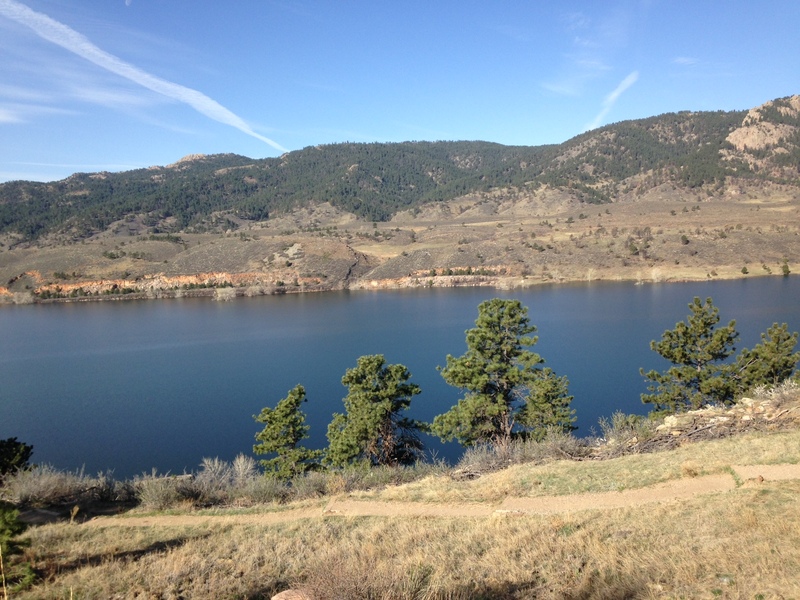 I turned around once I hit Horsetooth Reservoir. So many swims I took here (where you’re not supposed to swim) back in the day. I went 8.5 miles, and decided that after this marathon, I’m doing hill repeats like crazy so that I can at least kind-of handle hills next time I make it to a trail. As tempted as I was to run more trails, I didn’t think my flatlander legs were ready for a long run on them — especially since I’m three weeks out from a flat road race. So I headed back to the bike paths for 22 miles. It felt harder than usual, but I enjoyed myself as I ran through my old stomping grounds. 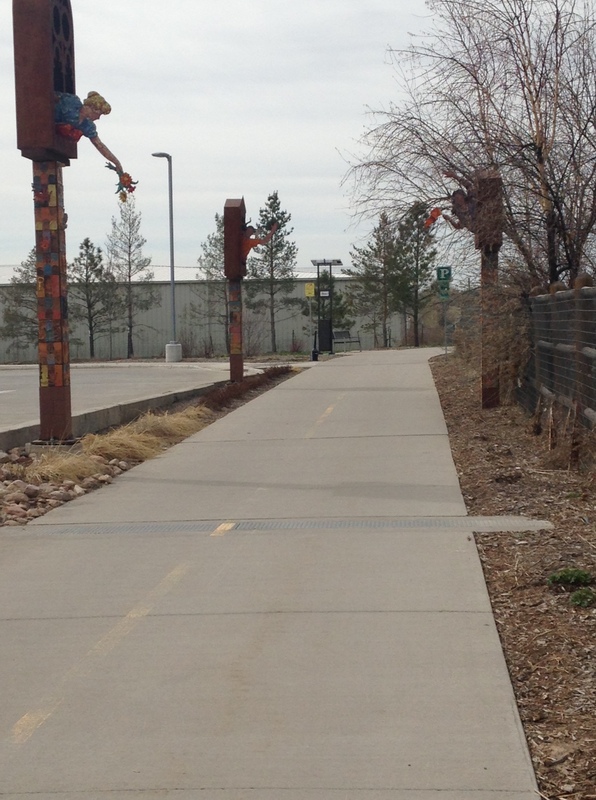 These were new… art that’s waving and offering high fives as you run by. It was very encouraging. 45 minutes of yoga, then some foam rolling. Now, I’m technically tapering, though this week will actually probably be higher mileage than the week before last. Three weeks ’til race day! And… back to work tomorrow. I have a hunch that these last few weeks of school are going to FLY. Anybody have any races/events coming up?